This morning we headed out in the steaming heat to meet with representatives of India's Southwest Rail. This morning we headed out in the steaming heat to meet with representatives of India's Southwest Rail. 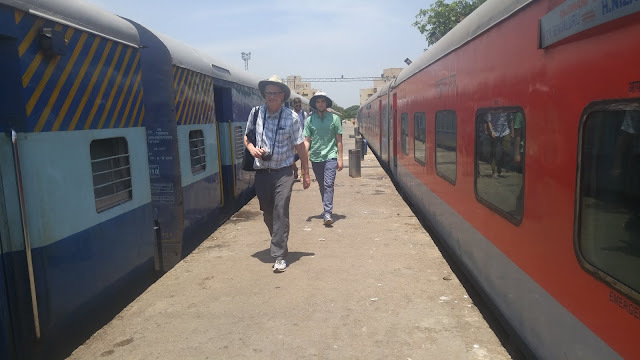 We will use this passenger rail service later in our trip when we travel out of Bangalore, but today we were there to find out more about operations. The lead mechanical engineer for the railway met with us and gave us a tour of the maintenance area of the rail yard. We started with some background information on the railroad which has 730 employees maintaining 1,100 coaches. Even with that number of coaches, the railroad does not have enough capacity to meet the demands of the people. Aruna, one of our trip leaders, had to wake up at 4 a.m. four months ago to ensure we got reserved seats. 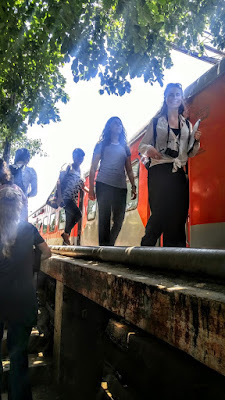 The railroad is not government subsidized and often struggles to break even because its fare prices are controlled by India's Ministry of Railways. To ensure enough income, the railway incorporates a graduated pricing scheme ranging from unreserved, non-air conditioned space in coaches to private, air conditioned coaches. By charging more for the higher quality transport, the railway is able to subsidize the less expensive fares. We were able to see two types of coaches on our tour of the maintenance facilities. One of them is shown in the photo. Because we were in the maintenance facility, we were able to observe people cleaning the trains. This basically consists of spraying the bathrooms and exterior down with hoses. We learned that while they would prefer to use high pressure hoses for this purpose because they use water more efficiently, they are unable to do so at this time because the devices that pressurize water are broken. Several other deficiencies were identified in addition to the excess cleaning water required throughout our visit. 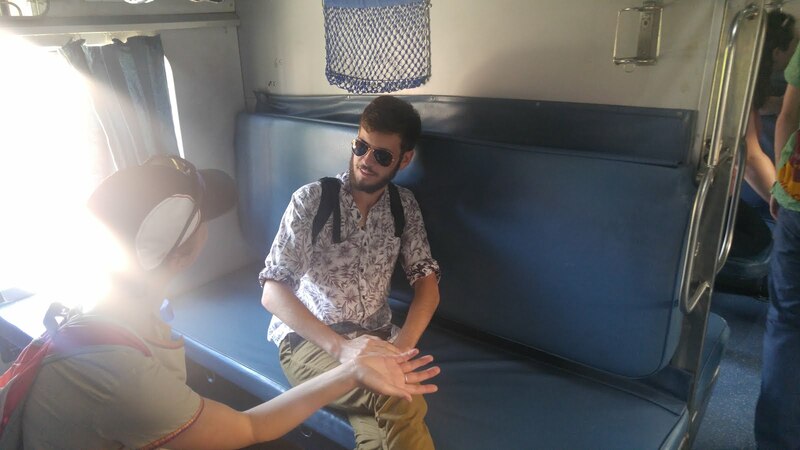 However, despite these deficiencies, the rail service is still heavily used by the people of India, particularly low income people because it is the most inexpensive mode of travel between India's cities. Comparing passenger rail here in India to passenger rail in the United States is fascinating given their different life cycle positions, funding schemes, and level of use. The passenger rail system in the United States reached maturity a long time ago and has declined since then while India's system has the potential to grow more. India lacks the substantial highway system the United States maintains, so auto travel is not as competitive here. Air travel within India has taken some passengers away from rail; however, air travel is generally not an option for low income passengers. Lack of government subsidy in India is intriguing considering the reliance on it back in the States for similar rail services. All in all, experiencing a regional travel method has been another interesting piece in the puzzle of India.